Sunroof, NAV, 3rd Row Seat, Heated Seats, CD Player. DEEP BLACK PEARL EFFECT exterior and BLACK LEATHERETTE interior, SEL trim READ MORE! Third Row Seat, Navigation, Power Liftgate, Heated Driver Seat, Back-Up Camera, Turbocharged, Satellite Radio, iPod/MP3 Input, CD Player, Onboard Communications System, Dual Moonroof, Aluminum Wheels, Remote Engine Start, Dual Zone A/C, Heated Seats Volkswagen SEL with DEEP BLACK PEARL EFFECT exterior and BLACK LEATHERETTE interior features a 4 Cylinder Engine with 184 HP at 4400 RPM*. ROADSIDE ASSISTANCE KIT booster cables, warning triangle, LED flashlight, work gloves, PVC tape, multi-tool, blanket, poncho, whistle, cable ties and bandages. Rear Spoiler, MP3 Player, Keyless Entry, Remote Trunk Release, Privacy Glass. Edmunds.com's review says Top-notch material quality is evident throughout. 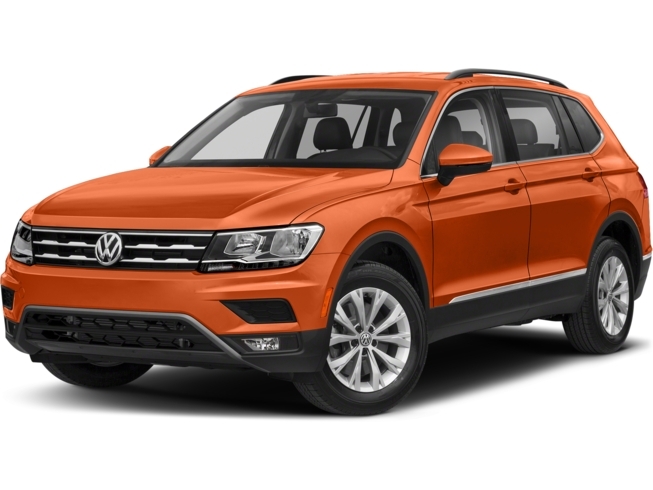 The Tiguan feels more upscale than most in the segment..